A solitaire engagement ring is the true definition of timeless bridal style. The simplicity of a solitaire design makes your center diamond the star and is all but guaranteed to be in style forever. You’ll never tire of its effortless, understated beauty, and because it can work with virtually any design, a solitaire offers the perfect opportunity to play with different wedding bands! 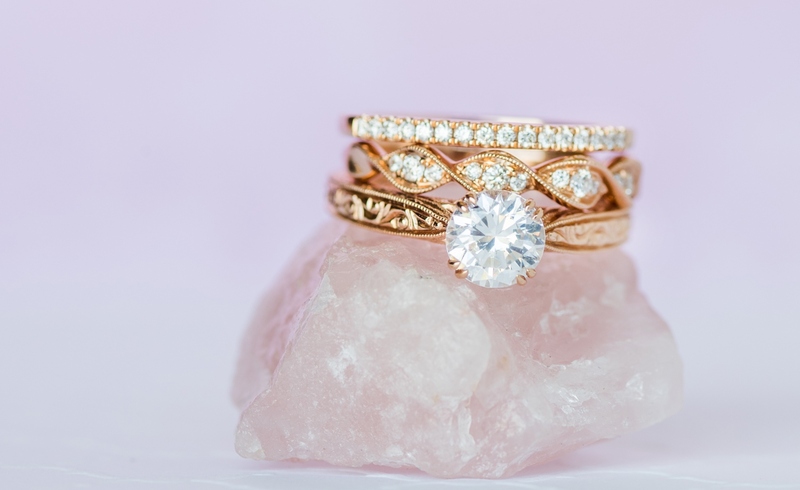 Whether the quest to find your bridal jewels has just begun or you’re looking to add sparkle with stackable rings, our handcrafted wedding band collection is full of intricate details designed to elevate any engagement ring style. 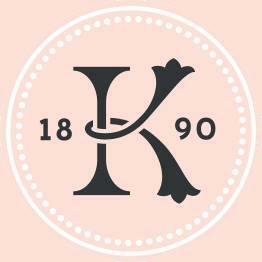 Here are some of our top picks for wedding rings that would look stunning with a solitaire. This whimsical wedding band from the Angelique collection features glittering swirls of diamonds and our signature handcrafted milgrain edging. With a chic whisper of romantic style, it’s the perfect partner to an equally elegant solitaire. Our Pirouetta collection gives a whole new meaning to delicate and swirly. 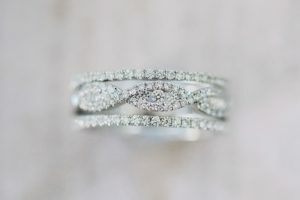 Case in point: this gorgeous diamond eternity band that would make a stunning accompaniment for a more subdued engagement ring. If colored metals are your true love, this feminine rose gold wedding band is a downright dreamy choice, as is this blush-colored diamond beauty. Both feature swirls of ballet-inspired diamond ribbons and would be truly eye-catching alongside a simpler solitaire ring. Enamored by all things nature-inspired? 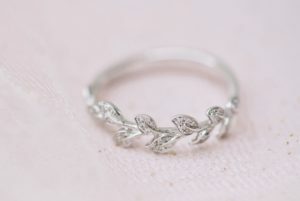 This unique wedding band with diamond studded leaves is a nature lover’s dream come true. In fact, our entire Dahlia collection is a love letter to florals, vines, and the natural splendor of our surroundings. Any wedding band from this collection would make an exquisite yet still subtle choice for your solitaire. Sometimes you just want to go bold with your wedding band, and we love a daring and unexpected combination. Enter the artistic Charlotte. This fun and fabulous collection of rings is sure to make a statement no matter what gemstone you pick! A perfect example is this Deco-inspired classic. A vision in diamonds and pink sapphires, it strikes the right balance of vibrant and sophisticated, yet romantic and feminine at the same time. Can’t pick just one? 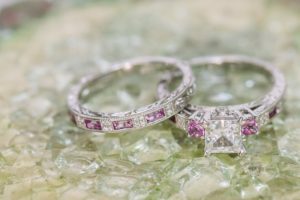 We can custom design the wedding band of your dreams, and you could also consider curating a diamond ring stack with multiple bands. 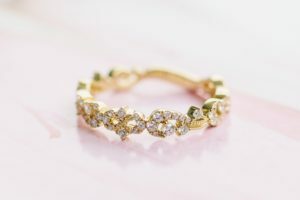 If you already have a traditional wedding set with a solid metal or diamond eternity band, you can always combine your existing rings with a variety of hand-engraved, gemstone, or colored gold versions for an eclectic stacked look. There’s no better time to fall in love with a band, because we’re offering the rare opportunity to save 10% on our entire wedding band collection! To enjoy our special pricing, make an appointment with your nearest retailer and place your order before May 31st. With so many different styles to choose from, we know you’ll be able to find the perfect one to pair with your solitaire!